This week we’ll be discussing Dow or Trans-Channeler crystals. It is a crystal shape that falls into the category of facets: number of edges, and is another example of a crystal with two names for the same configuration. More commonly, they are referred to as Dow, (named after JaneAnn Dow by her friend and fellow crystal worker and author, Katrina Raphaell). Trans-Channeler is what Melody (from the “Love is in The Earth” series of crystal books) calls them, and it is a more descriptive name if you don’t already know what they are. These crystals are both Channelers and Transmitters in configuration, (Transmitter+Channeler = Trans-Channeler). This is another crystal that you cannot correctly identify unless you count the edges of the faces. There will be three seven-sided faces with a triangular face between each of them. So the edges of the six faces will count: 7-3-7-3-7-3. A text-book perfect Dow or Trans-Channeler will have symmetrically-sized faces and a centrally located tip. Others may be uneven in symmetry, but the count will be correct. These are still Dow crystals. I am guessing this may sound like a lot of gobble-de-gook! To understand what I just described, we need to review the anatomy of a crystal. In a basic quartz point, there is the body (the cylindrical part) and the termination. In determining whether we have a Dow, we’ll be discussing the termination. More specifically, the faces and edges of faces. The termination is divided into what are called facets or faces. A typical quartz crystal point will have six sides on the body and six faces on the terminating end. Usually, there will be what is called a “main face” which is typically the largest face of the point. Most crystals have one main face (Channelers fall into this category). There are crystals which have two main faces (Transmitters fall into this category), and crystals which have three main faces (Dow or Trans-Channelers fall into this category). Remember, Transmitter (2) + Channeler (1) = Trans-Channeler/Dow (3) main faces. 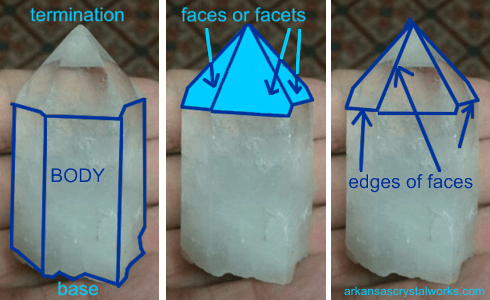 To determine whether the crystal you have is a Dow, you will need to count the edges of each face. 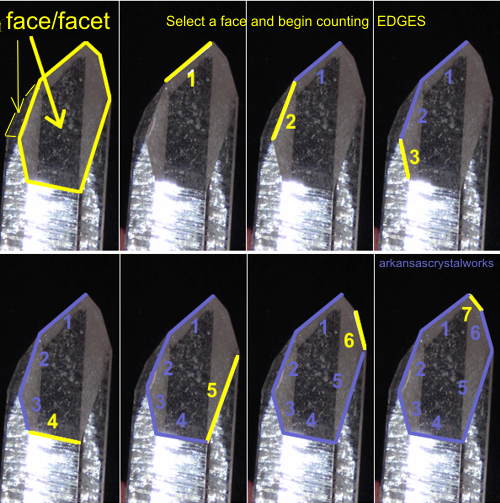 This is easy if you start counting edges on the main face (or any large face in the case of a crystal with more than one) and work your way around the top of the crystal, counting the edges of each face. Take each face as if it was a separate entity, and it will be easier. Beginning with the main face (remember, this is usually the largest one), put your thumb or finger on one of the edges of the face (to keep track of where you started) and count. Discover the counting method that works best for you and use that one. Keep track of how many edges each face has. 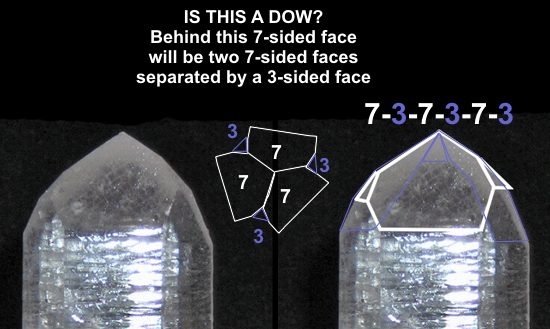 If you get to a large face that doesn’t have 7 edges, or a small face which doesn’t have three, you don’t have a Dow. What kind of energies do Dow or Trans-Channeler crystals bring to the table? Dow or Trans-Channelers combine the qualities of the Transmitter and Channeler crystals. Channeler crystals help you access higher wisdom, either in the form of your Higher Self or Spirit Guides, or of Angels. They exude a crisp, regal energy. Channeling crystals can bring you love and light from beings in the higher realms. Transmitter crystals work much like Channelers, only double! They have a proud, almost mysterious, feel. I picture them as two sentinels standing not quite side-to-side and not quite back-to-back. I like them because their main face is between two diagonals the energy is unexpected and special. So a Dow crystal has all of the qualities just described. They also provide a connection with the Self and Universal Truth. Dow crystals have a special energy about them that is sharp, clean and direct. Sevens and threes are both mystical numbers on their own, but to have a combination of three of each, all balanced in one crystal point is even more mystical and special. Because of the repeating numbers as well as the symmetry needed to incorporate such a design, Dow crystals are also about balance… not just regular balance, but special balance, unique balance, inspired and divine balance. and Dow crystals help us to connect with divine and inspired balance. I hope you have enjoyed this discussion about Dow or Trans-Channeler quartz crystals; what they are, how to determine if you have one, and how to work with them. Next time we’ll discuss Drusy quartz crystals. See you next week for Drusy (pronounced DRU-zee) quartz crystals. Tagged crystal types: dow, crystal types: trans-channeler, crystals, how to, metaphysical descriptions. Bookmark the permalink. Love these articles so much. So appreciative of you sharing your expertise, Genn. Thank you! thanks for sharing your beautiful talking stick, Tania! I have the most comprehensive, articulated collection of Herkimer diamonds on Earth. 1,500,000 carats of everything ever made by God, getting close to making the photo. Just liked your energy. Thank-you. Edge. Hey Edge! Thanks for your comment! That’s quite a collection! !